Do you have a favorite sewing blog you follow? Well here is ours: Merrick's Art. Merrick is an adorable mommy who has found ways to impress us everytime with the way she alters clothing. So when we chose to talk about making old pieces new on the blog this month, we NEEDED Merrick to guest blog! Here she is! I'm Merrick from Merrick's Art where I blog about sewing, style, and life. 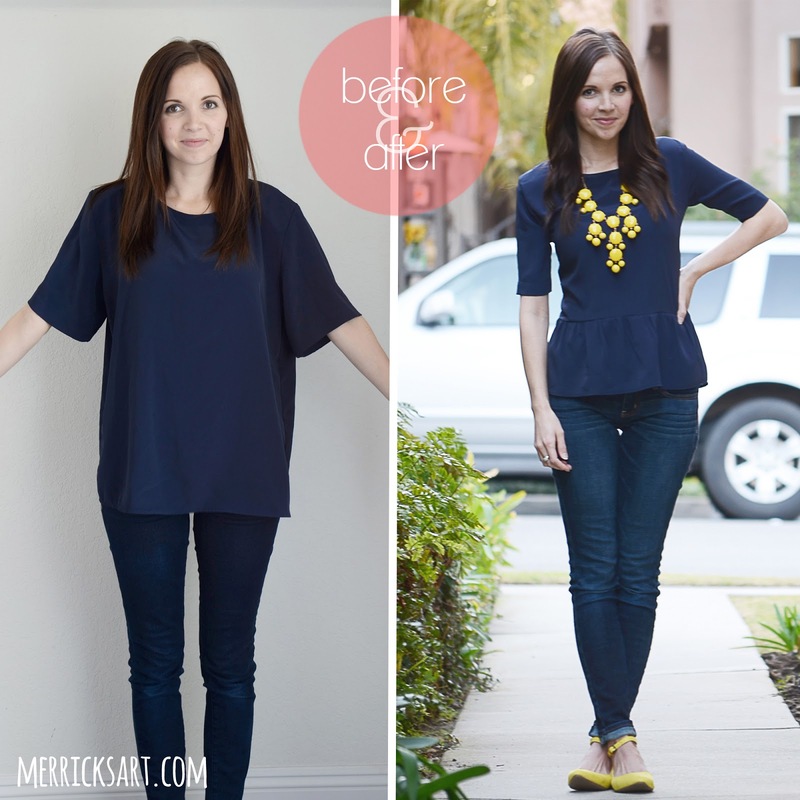 I'm excited to share a really fun refashion here today! Many months ago, I went thrift shopping and picked up this ginormous navy blouse. I had no brillant refashioning plans, so it sat in my fabric box for many months until just recently I saw a navy peplum top and instantly knew that's what this top was destined for. With my 2013 goal to be a better seamstress, I really took my time on this project, making sure to think through each step, and I am thrilled with how it came out! I didn't have a blue zipper, but this green one made for a fun pop of color -- now it's my favorite part of the top! This isn't a difficult tutorial, but it does have a lot of steps. Just forge through! STEP 1. Using a seam ripper, remove the sleeves from the bodice. STEP 2 (Part 1). Measure from your shoulder to your natural waist, and then carefully cut your blouse to that length. Set aside the extra fabric from the bottom of the blouse -- this will become your peplum later on. STEP 2 (Part 2). If your material isn't stretchy, you'll probably need to put a zipper in the back so you can get in and out of the shirt once it's slimmed down. Cut a straight line down the back of the shirt and insert a zipper. I used a 22" invisible zipper, and cut it down to be about 17" or so. You can make your zipper go all the way down the back -- I left about 3 inches at the bottom and just sewed that part closed. STEP 3. Moving to the sleeves, pull the oversized sleeve (turned inside out) up your arm and mark with a pin how much you want to take it in. Make sure your seam curves to allow some movement at the armpit (as seen below). Sew with a straight seam along the dotted line, then trim off the extra fabric and zigzag or serge the raw edge to prevent fraying. STEP 4. Going back to the bodice, turn it inside out and try it on. Mark with pins where you want to take it in (make sure your zipper is centered in the back). Carefully remove the top and sew with a straight stitch along your marked lines. Trim off the extra fabric and zigzag or serge the raw edge to prevent fraying. STEP 5. Now it's time to attach the sleeves to the bodice. First, try on the bodice and measure how wide you want the shoulder width, then trim the arm holes. I cut mine down to 4 inches wide, as seen below. Then, with right sides together, pin the sleeve to the bodice, as seen below. The arm hole on the bodice will probably be slightly larger than the arm hole on the sleeve -- this is normal. As you pin, distribute the extra fabric evenly between pins, and then as you sew, stretch the fabric as much as you can and you will be able to avoid tucks. Sew around the entire sleeve with a straight stitch, then trim off the extra fabric and serge or zigzag the raw edge. Once your sleeve is attached, turn it right side out and press. The extra arm hole fabric, that I mentioned above, might create a little waviness, but it will iron right out as long as you don't have any tucks. Repeat STEP 5 to attach the second sleeve. STEP 6. Now let's move to the peplum. Take the bottom of the blouse that we cut off at the beginning and trim it down if necessary so it's completely even all the way across. (mine was 7" tall once it was trimmed). STEP 7. Measure the width of the bottom of your bodice (where your natural waist is), and cut 2 pieces of elastic in that length. Sew the ends of the two pieces of elastic together to make a big circle. Pin the circle of elastic to your peplum (I pinned mine in four places, which you can see two photos down, and sewed in sections, pulling the elastic tight in between pins). Sew around the entire peplum, stretching the elastic as you sew (as seen below). STEP 8. With right sides together, attach the peplum to the bodice. Using a straight stitch, sew next to the elastic (don't sew on the elastic!) as shown below with the dotted line. Once the peplum is attached, use a seam ripper to remove the elastic (keeping it there just adds bulk to the waistline, which you don't want, obviously). Once the elastic is removed, trim the seam allowance and zigzag or serge the raw edge to prevent fraying. I used all the original hems, so press all your seams and you're done! 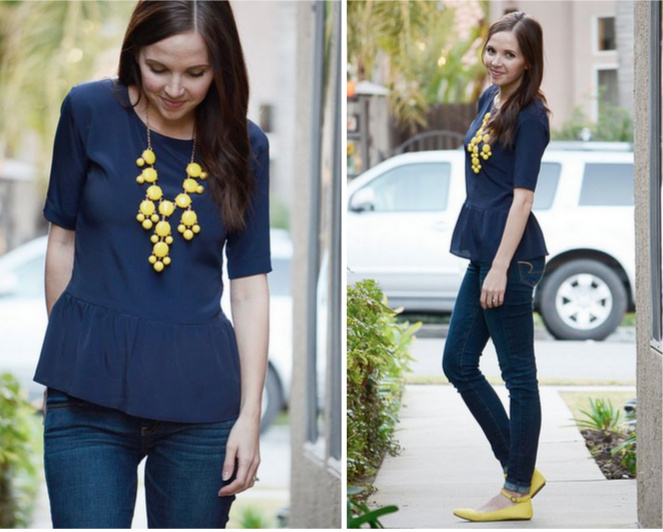 Voila -- a peplum top! Look familiar? Please visit Merricks Blog for more projects! Are you going to try to make a peplum shirt? This is awesome! and super cute ~ thanks for the tut. nice idea. would plain gathering do instead of using the elastic? Great tutorial, also, looking good on you. I believe many girls are going to try this outfit so that they can look pretty like you. My scene is different, I can't be like you, but I'm surely gonna try to make same like this. tutorial is very easy and I believe I'll not get stuck in the middle with anything. Thanks for sharing some great creativity. In the past year I lost 60 pounds! This will be a great way to be able to wear the huge shirts I pulled out of my closet! I'm excited to give it a try.